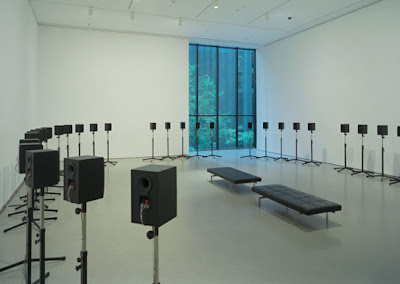 My all time favorite piece at MoMA to date: The Forty Part Motet by Janet Cardiff. Video does this absolutely no justice, as the piece is created by forty separately recorded choir voices, played through forty speakers placed throughout the exhibition space and is only fully absorbed by walking from speaker to speaker to hear every inflection and note. Or perhaps by sitting in the middle of the room for the entire 14 minute loop. I wish it was permanently on display at MoMA, alas it's been away since 2006.